Oh, I am not happy to see this press release. FINAL VOLUME OF THE ULTIMATE FOOD MANGA – OISHINBO RELEASING JANUARY 19TH! The Last Hand-Selected Volume Out Of A 100+ Volume Hit Series Exploring Essential Elements Of Japanese Cuisine is coming to an end. 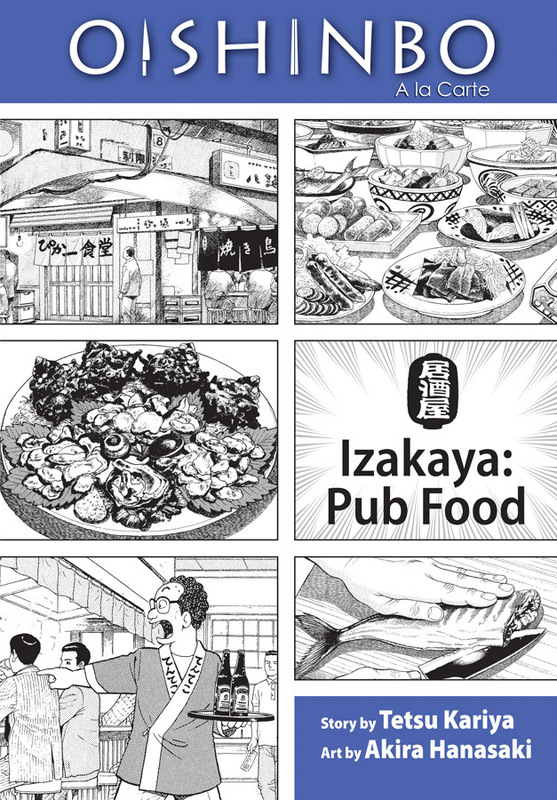 Volume 7 Izakaya-Pub Food Is Here! DECEMBER 10, 2009 – VIZ Media announced today the release of the final volume of the mega hit food manga by Tetsu Kariya, OISHINBO due out on January 19th. Volume 7, Izayaya-Pub Food is rated ‘T’ for Teens and carries an estimated retail price of $12.99 US and $16.99 CAN. Izakaya occupies the same vital space in the Japanese culinary landscape as tapas bars in Spain or tavernas in Greece. Unpretentious and frequently boisterous, they’re places to meet with friends or business partners to unwind over drinks and small dishes that range from hearty standards to refined innovations. In this volume of OISHINBO, Yamaoka and Kurita investigate classic Izakaya foods such as edamame and yakitori, devise new dishes to add to the menu of an old shop, and discover how the concept of “play” is essential to the enjoyment of food. OISHINBO creator Tetsu Kariya, writer and essayist extraordinaire graduated from prestigious Tokyo University. Kariya was employed with a major advertising agency before making his debut as a manga writer in 1974 when he teamed up with legendary manga artist Ryoichi Ikegami to create Otoko Gumi (Male Gang). The worlds of food and manga were forever changed in 1983 when Kariya, together with artist Akira Hanasaki, created the immensely popular and critically acclaimed OISHINBO. “Fans of Japanese cuisine and culture have been delighted with every volume of the critically acclaimed OISHINBO series and we are excited to bring them this final volume that covers the excitement of izakaya,” says Evelyn Dubocq, Sr. Director of Public Relations, VIZ Media. OISHINBO (or “The Gourmet”) depicts the adventures of journalist Shiro Yamaoka, who writes for the fictional newspaper Tozai News. When the paper’s top executives decide to create “The Ultimate Menu” to celebrate the paper’s 100th anniversary, Yamaoka, known for his reputation as a foodie with culinary skills to match, is given the daunting assignment. With the help of his coworker Kurita, Yamaoka begins an epic saga to find unique and tasty dishes that will compose this ultimate bill of fare. Each volume of OISHINBO focuses on specific foods and culinary trends such as sake, sushi, vegetables, rice dishes, ramen, and Izakaya (pub food). VIZ Media has served up selected highlights from this epic 100+ volume series and compiled them into seven a la carte editions that can be enjoyed individually or as a series. OISINBO has further inspired a 136-episode anime series, a live-action film and TV dramas, video games, recipe collections, and TV shows in Japan. For more information on OISHINBO and other VIZ Media titles please visit http://www.Viz.com. It’s a good thing it’s about pub food, since I’ll need a drink or two to ease the pain. I’ve really enjoyed this series, and I hope Viz decides to do a second round. There are currently 50 volumes in the A la Carte series in Japan. This entry was posted on Thursday, December 10th, 2009 at 7:59 pm and is filed under Press releases, Viz. You can follow any responses to this entry through the RSS 2.0 feed. Both comments and pings are currently closed. Wow. I wonder if there is another way to access them? Translated of course. I’ve really enjoyed this series as well. Thanks for the heads up. NOOOOOOOOOO! I want to read the tofu volume! Is there a translated list of all the titles of Japanes A-La-Carte volumes? If Viz put out editions over time or all at once, I’d be there. Each of the reprints so far have risen to the top of my “read now!” stack of books as they get into my hands. The only good news would be in Viz is considering printing English-language editions in sequence. It looks like there’s a lot of interesting development in the characters over time that’s obscured in the food-themed volumes so far. The one story in the books so far that comes before the newspaper staff knew who Yamoka really is suggests that the early stories unfolded those story aspects effectively over time. I would love to see a volume dedicated to the wedding. I think Kate Dacey suggested that, maybe on Twitter, and I think it’s a great idea.